Have you heard recessed downlights? 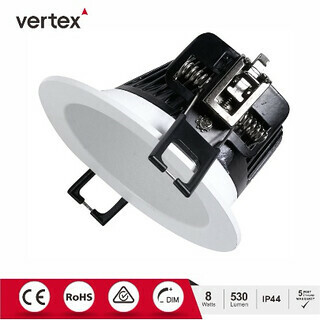 Chinese led manufactures-Vertex can tell you some knowledge about these. 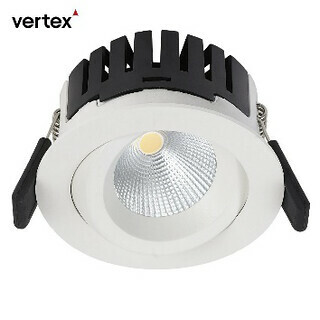 Here we will help you to find all the information needed for deciding on what type of led downlights is best for you. “What kind of downlights do I need?” and “Do my down lights need to be fire rated?” Meanwhile, every situation is slightly different, so we have this guide to provide some information that may be helpful. Downlights are becoming increasingly popular, especially in kitchen and bathrooms. The most important feature is to maintain the overall unity and perfection of the architectural decoration. It will not destroy the perfect unity of the ceiling art due to the setting of the lamps and increase the soft atmosphere of the space. All the downlights described below are available in every finish, including white, chrome, brushed nickel,matt black, anti-brass,gun metal and so on. (1)They conceal the recessed fixture behind them. (2)They direct and shape the light downward. (3) They provide a finished/decorative look. 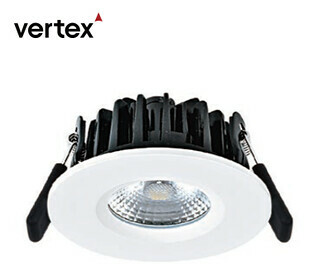 Fixed downlights are a decorative downlighter that has a fixed center. The lamp is usually fixed within the holder either by using a spring clip or by a twist lock mechanism. The spring clip is compressed a little and placed over the front of the lamp where it then expands and sits within a groove holding the lamp in position. The twist lock is normally used in higher quality die-casting aluminum fittings where the front of the fitting has a removable section that twists and locks into place holding the lamp in position. A gimbal downlight is constructed in the same way as other downlights. They are similar to eyeballs except they pivot within the housing, so they protrude less from the ceiling. Their range of motion is the same as the eyeball but at full range the trim may cut off part of the beam of a wide-angle lamp. An eyeball down light is similar to a gimbal but can be adjusted through a greater range. It allows you to control the direction of the light. Their range of motion is typically 30° tilt and 359° rotation. These are mounted in the ceiling but they are very different in their application. Wall washer down lights have the lamp contained within a hinged housing that can rotate to 90 deg. These are used to shine light onto the walls as opposed to straight down. After reading this article, have you got some? Do you think this blog helpful for you? If you want to learn about more, follow us and we will update more knowledge for you.